December 2002 | His Kids Too! We hope that you and yours had a wonderful holiday season. This Christmas was quite different for our family, as we were all apart. I’ll explain, but we are all now home after 22 days in Ukraine. Rich, Teresa, Artur and Haley all went to Ukraine, while Dallas and Lydia stayed back in the states. The purpose of our trip was 3 fold: first to adopt our daughter (preselected), secondly, distribute humanitarian aide (His Kids, Too!) to hundreds of children, and thirdly, to visit with our dying friend, a wonderful artist of 37, single mother of 1 daughter. Two years ago while visiting Ukraine on a His Kids, Too! humanitarian aide distribution trip, we spotted a little girl, that we decided that we would make a concerted effort to find her a home. We prayed and prayed that someone would come for her, and on each trip I would visit with her. Visit after visit she was still there. We took prothesis to her in summer 2002, and played and visited with her. In September of 2002 our local newspaper even did a story on her, 3 people called about her, but no serious results. At that point, Rich and I (after much prayer), decided, this was ‘our’ calling, and we started the paperwork. We started our paperwork for our daughter in October, sending everything to Ukraine early Dec., and received a travel date for December 23rd. Yes, I stated that our daughter was preselected, and she was. We did not break any rules/laws, etc. in Ukraine, but what we did do is speak directly with the new Adoption Center director and get her approval to adopt this beautiful child. Our daughter is not medically perfect, and that is why we could do this. During my trip to Ukraine in October, I had the pleasure to speak with Mrs. Parienko, Director of the National Adoption Center of Ukraine and the psychologist. I expressed the interest to adopt Alla, from the Donetsk Baby House orphanage in Donetsk. They were very agreeable, and said, ‘no problem.’ Let me say, and stress, we were able to get this approved preselection, due to our daughters medical situation; she has no feet, and only 3 fingers (total). Mentally, she is sharp, and developmentally delayed just slightly! We traveled right in the middle of the Christmas holidays, and only had a total of 2 days of delays. This is due to our facilitator and he did a beautiful job of rushing paperwork through the system. All was fairly smooth concerning the adoption, and we are home, and Alla is thriving, doing beautifully, and I do attribute this to our knowledge of Russian, (additionally, we have a Ukrainian friend living with us, which is a huge benefit) and continue to encourage people that are adopting children 3 and older, to learn some Russian. Pictures of our daughter can be found on the ‘Summer Photo Gallery‘ in the section, ‘Alla,’ and our adoption journey photos are on the December 2002, ‘Alla’ section. Our second mission was Christmas gift distribution, which went quite well. Pictures of this can also be found on the Photo Gallery Dec. 2002 section. With a huge thanks to all the many donors to His Kids, Too! we were able to provide a wonderful assortment of gifts of clothing, toys, shoes, and essential life items (toothbrushes, sheets, medicine, etc.) for over 600 children. In part, our big donors for this trip were the 6th grade Geography students at Raa Middle School (Tallahassee, FL), and Elementary students from Florida High (Tallahassee, FL). They rallied at for the cause, and in addition to their material donations, they collected over $650.00. Truly, their donations made an impact on the lives of hundreds of children/orphans. Additionally, we were able to provide a wheelchair for little Natalia (see Fall 2002 trip photos), and much needed medical supplies for Bogdon (see same photo area). We had the wonderful opportunity to see 2 Christmas Programs at orphanages, which brought tears to our eyes to see these children perform. Our daughter, Alyssa (Alla) was a Snowflake in her program, and it was just wonderful! The staff warmly welcomed us, and we were treated as special guests. We were thrilled to leave your gifts with them for the Alla’s roommates and the other children. Alla was able to play ‘Miss Frost,’ and Artur ‘Father Frost,’ when we visited the local Orthopedic Hospital. Each of the 60 children in the hospital received a toy, and additional toys, clothing, shoes, orthopedic equipment, and medicine were left for children as needed. It was quite interesting for Alla to be the one to ‘give’, and she was delighted to able to help these children. Please review the photos on the Photo Gallery (December 2002) for this distribution. Our son, adopted 3/99, from Mariupol, was able to return to Mariupol and be ‘Father Frost,’ passing out gifts to all the children in the orphanage (about 75). The photos of this and other children at the Mariupol orphanage can be seen on the December 2002 Photo Gallery. We were also able to take packages that other adopted families sent with us. Getting from place to place was a challenge, as weather was not the best, snow, ice, rain, mud, sleet, but the Lord was with us, and our goals were accomplished. Funds were left with our staff members there to continue the diaper, juice and other ongoing programs. and, a mother of one 15 year old daughter. We solicit your prayers on Sveta’s behalf, as she now make some decisions concerning her future without the guidance of her mother. 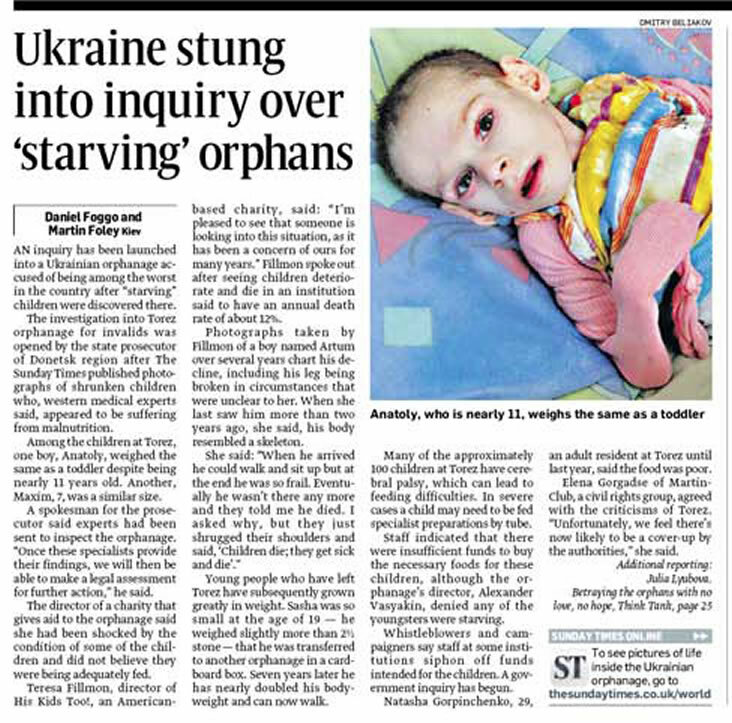 Our work is on going in Ukraine, and, Lord willing, I plan to travel again in early April for aide distribution. We still have many needs to fill, and programs to monitor, and have just taken on another orphanage of over 200 children that are in desperate need. We can not begin to thank you enough for the outpouring of love you have shown for the widows and orphans of Ukraine. Each time we go, we wish each of you could be present for the joy and gratefulness expressed by these folks for your kindness. They tell us over and over, ‘please tell your friends, thank you!’ And I tell them, I will… and I do, though many of you, I do not know, but what I do know is that the Lord has impressed upon your heart a tenderness for these wonderful deserving children. We, at His Kids, Too! hope that each of you had a blessed holiday season. Please feel free to forward any comments or questions.